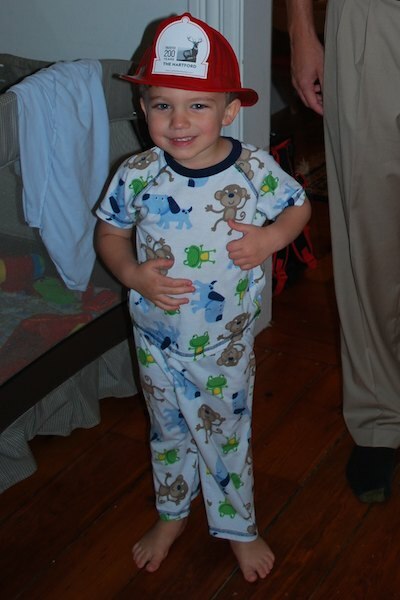 Seth at Four Years and Four Months Old: Pajamas All the Time! Seth has had a great start to the year with his second year of Tiger School. His teachers, Ms. Cathi and Ms. Barbara, are amazing, and we are so blessed that Seth gets to have another year of pre-school with them before he heads off to kindergarten next fall. (sniff sniff, can't believe he will be in kindergarten next fall!) He had a great conference at the end of last year, when Ms. Cathi provided us with this amazingly organized binder of Seth's work that she had put together throughout the year. It was so neat to see how he had progressed in terms of being able to write his name and draw a person, among other things, since the year started. They confirmed a lot of things we were seeing at home in terms of Seth always being interested in stories, having a good attention span and auditory memory, and starting to understand some sight words and phonics. 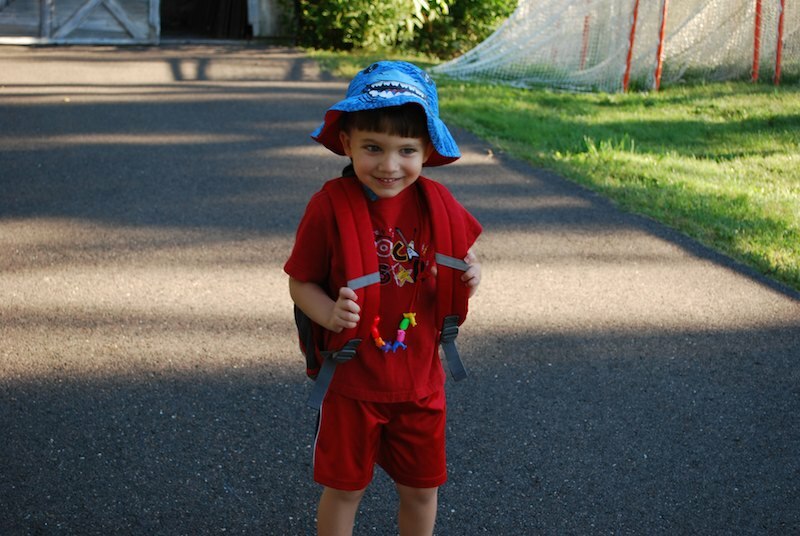 Over the summer, Seth would ask from time to time how much longer until he started Tiger School again, and was so happy to get back to his friends and his teachers this fall. He knows all the routines this time around, so he could focus right in on the learning. His teachers definitely added in many new things since this is the second year of pre-school for all the kids: charts, patterns, shapes, number of the day, color of the day, puzzle piece of the day, starting to work on reading/word families. Seth can now write his first and last name with no model, which is amazing. He does that funny thing that kids do when they run out of room on one line - he might write S-E-T, and then put the H on the next line. Love it! The teachers have come up with a couple new classroom systems. One is to wind-up a music box at the beginning of the class and open it each time the class is being noisy. If there is any music left at the end of class, the kids each get a smartie. The other system is that each child gets a "gold tag" every time they do something positive. Whoever has the most tags at the end of the week gets to pick the theme for the next Friday's "Fun Friday." The kids are hysterical, because they all love wearing pajamas to school, so they have always been finding some way to involve pajamas. When Seth won he chose pajama day, then the next child chose Polar Express Day (get to wear pajamas), and for this week, the child chose Polar Discovery Day (where the kids got to wear pajamas and taste pineapple). These kids crack me up! And Seth is so excited about wearing pajamas every time. He also had fun when we bought apple cider donuts to bring in for his whole class when we went apple picking (last year we made apple crisp). It's hard to believe that Seth is almost four and a half! It was fun to see him so comfortable over the summer attending some activities on his own. He went to a little morning camp run by the Town Parks and Rec for two weeks, and adjusted so well to being there, even though the few kids he knew from Tiger School were in a different group. He did a little painting class, and he really enjoyed that and took pride in what he made. He made a lot of progress in swimming class. It was fun to have our mornings together with Evan, and then have some time just with Seth in the afternoons while Evan was napping. We would do crafts, or read, or play, or lots of other things. It is nice I still have Monday and Tuesday afternoons for that even though I am back at work now. And it was great over the summer to have Jason working 7am to 3pm - gave us lots of family time in the afternoons. Seth is really enjoying his role as a big brother. He has decided that he is the only one who can teach Evan new words, so he is always trying to get Evan to talk. He can be trusted to do more things now, and usually he doesn't take the responsibility lightly. We can ask him to help us keep Evan awake in the car by talking or singing to him, and this is actually a big help. The two of them can play more side by side now, with legos or trains, usually without squabbling for at least a few minutes. Seth has come a long way since he was two and a half, meeting Evan for the first time, kissing him over and over again in the hospital! Seth can always be counted on for an energetic, enthusiastic response to whatever activities we plan for him. Whether it's apple/pumpkin picking, swimming, or hanging out at home, he will usually greet each activity with his signature smile and laugh. Of course, all children whine/misbehave from time to time, but consequences like no dessert or no bedtime books prove to be effective on the occasions we have to use them. We always have a good time with Seth, and he is a pretty funny little guy. This summer, he got it in his head that his camp counselors were called "owners"
He keeps on surprising on by using impressive new words, such as "strength" and "continuing"
He is interested in spelling and sounding out words. 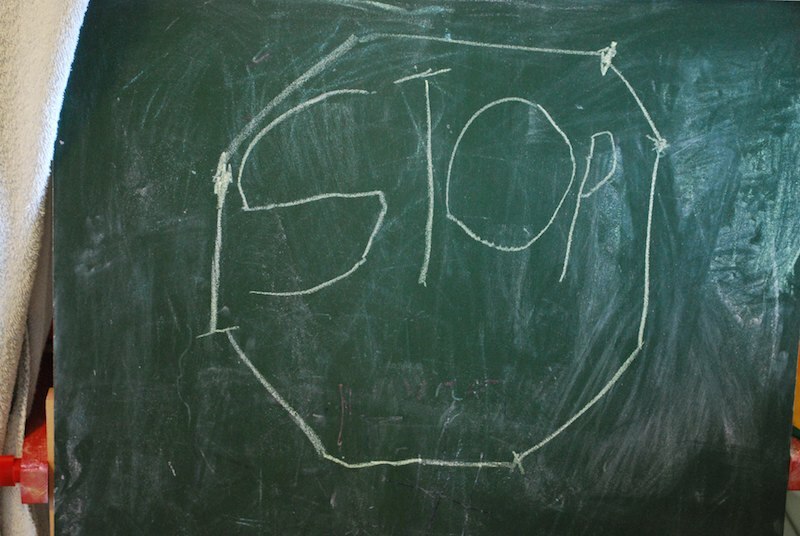 He wrote "stop" all on his own, and even sounded out the word garbage, with a spelling something like "gabig"
He likes to practice "reading." The other day he and Grams each had a copy of "Two Apples Up on Top" and they were sounding out the words together. Seth is brave in new situations - over the summer there were a couple times when he really surprised us - helping the clown out at the circus and singing a solo at a concert - he didn't hesitate. Then he was disappointed when he wasn't chosen as a volunteer at a magic show. Part of growing up. We realized that he refers to cigarettes as "steampipes." We've never really discussed cigarettes with him, but of course he's seen people outside at various places with them, and he came up with his own name. When talking about our summer days, he said "I like these days, too"
Seth said "I love you very very very much and Ronan very very very much, so that means I love you the same height!" Seth told us recently that he remembers things by picturing postcards in his head. Pretty impressive! Looking forward to more fun over the next few months!